The selection of the next Secretary General of the United Nations used to be a pretty dull affair. At least from the viewpoint of the general public. The big five states, the permanent members of the Security Council would, after a bit of behind the scenes wrangling and horse-trading, agree on the least-undesirable candidate. This time around, however, things are a bit more fun. And that’s not just because there’s a Slovenian entry, too. Former president Danilo Türk made it no secret that he eyed the position soon after he lost the 2012 re-election bid. In fact, his entire diplomatic career, save the five years he spent serving as president of the republic, was connected to the United Nations in one way or another. Be it the country’s ambassador to the organisation and later a non-permanent member and (at one point) even chair of the UN Security Council or, further down the road, serving as Assistant Secretary General for Political Affairs during the tenure of SecGen Kofi Annan. Add to that his mileage as professor of international law, his charity work and work in various forums and NGOs as well as contacts he developed around the world during this time, he’s a pretty strong candidate, at least on paper. Perhaps second only to Bulgaria’s Irina Bokova, the head of UNESCO and widely touted as the frontrunner of the field consisting of eight candidates. Besides Türk and Bokova these include Srgjan Kerim, former foreign minister of Macedonia, Igor Lukšić, foreign minister of Montenegro, Vesna Pusić, former foreign minister of Croatia, António Guterres, former Portuguese PM, Helen Clark, former PM of New Zealand and Natalia Gherman, former foreign minister of Moldova. Did pengovsky say eight? Sorry, he meant nine. Namely, on the eve of the first day of “informal dialogues” with candidates Serbia submitted former foreign minister Vuk Jeremić as their entry, bringing the number to nine, with five of those coming from countries of former Yugoslavia. Indeed, the fun part of this (s)election process is the sheer number of ex-YU candidates. All that’s missing now is a Bosnian candidate (or three of them) and we could have a rotating presidency, like in the good old days. But since we all know how that ended, maybe it’s best not to go down that road. Anyhoo, while it was much fun to watch the candidates “informally present themselves” in a rather formal and organised manner, it was also fun to watch the representatives of UN member states and various groups somewhat struggle with the new process. While some questions to the candidates were specific to the point of crafting policy, others were outright duds, as if the representatives of member states didn’t exactly know what to do will all this (informal) power vested in them. This goes for Türk’s hearing as well. He was asked a couple of hard questions, mostly on UN evergreens such as the Middle East conflict and misconduct of UN peacekeeping forces and he sailed through those pretty smoothly. But then again, he got a few softballs that were like “Dude, why are you even asking this? !”, but there, too, Türk fared pretty well, not coming across as patronising or condescending, an oft-repeated criticism during his stint as Slovenian president (full disclosure: pengovsky was involved with Türk’s 2012 reelection bid). But the best part of today’s hearing was Liechtenstein asking Türk about his commitment to accountability and transparency. Liechtenstein and transparency. Now there are two words you don’t usually see in a positive correlation. But hey, if Arab countries can pretty much choose to ignore the various wars and conflicts on their own soil, if Israel can shift the blame for the shituation at home solely on the Palestinians and if Saudi Arabia can chair the UN Human Rights Council, then poor little Liechtenstein preempting the transparency issue any way it can is perfectly legitimate. After all, this is the UN. And this is where Türk seems most at ease. Internationalist, but not interventionist. Recognising the sovereignty of member states, but not isolationist. Reform minded but recognising that different groups have different priorities. Good with buzzwords (people first!) but mindful of the reality and the UN’s heritage. 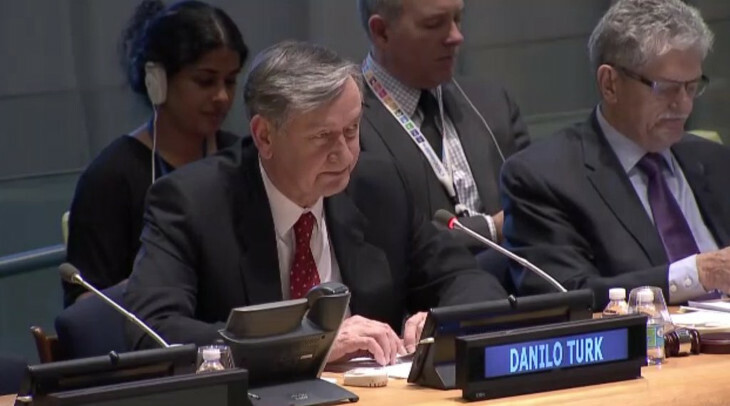 Our Q for @_DaniloTurk at #nextSG hearings: what purpose should @UN be fit for? So, all in all, the man did good. Definitely better than a lot of people in Slovenia are willing to admit. In fact, a considerable amount of energy is being spent by his detractors back home to paint him as unsuitable for the job. Mostly on account of his supposed divisiveness, asking how can he unite an international organisation if he can’t even unite a country. First of all, it’s kind of hard to unite the country where a major political player with a substantial following (who is now on the outs, but more on that in the coming days) is painting you as the devil incarnate and working actively to undermine any possible consensus in the country, political and otherwise. And secondly, despite their name, the United Nations were most likely truly united only once in their history: When the original 50 members signed the UN charter. From that point onwards it was about geopolitics, own interests and alliance-building. Which is a part of the reason why the organisation’s top position is “only” a Secretary-General and not a full-blooded President. The UN is not about unity, it is about building a consensus, i.e. the smallest possible level of disagreement, one issue at a time. And this is something Türk knows how to go about. At least in a UN setting. And when people ask, what will Slovenia gain Türk if gets the job, the answer is “not much”. After all, the government to date spent a ludicrous amount of EUR 7514 (that’s right, 7k euros) in relation to his bid. So why should there “be something in” for a country in what is essentially a private individual’s campaign (true, the government did endorse him and formally put his name forward, but still). What is at work here is the unhealthy tribal instinct of Slovenians where a Slovenian who – against all odds – makes it out there in the big, big world, is somehow morally bound to help his fellow compatriots with jobs, pet projects and free money. They don’t realize that the primary concern is that of the employer. Just as the EU commissioner from Slovenia has to take care of European policies and not those of his/her home country, so is the UN Secretary General tasked with running the UN smoothly and not with promoting the agenda of his country of origin. One of these days we’ll all learn. But not today, apparently. Anyhow, for all the bravado of the new selection process, the fact remains that when all will be said and done, it will be down to the permanent members of the Security Council to come up with a name. Which means that the back-room dealing is far from being over and done with. And it is entirely possible that a completely different name comes up on top. Still, one would hope that the entire process will be slightly more civil than the upcoming Republican convention.